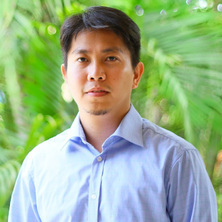 Dr Reydick D. Balucan is a geochemist who contributes to research in (a) CO2 capture-storage-utilisation via mineralisation and (b) advanced environmetal technologies for coal permeability enhancement. He received his Ph.D. in Chemical Engineering (The University of Newcastle, UoN) in Feb 2013 and his B.S. in Chemistry (Philippines) in 2004. Prior to his research work in Australia, he worked as a geoscientific chemist in the geothermal industry and taught undergraduate chemistry in the Philippines. Balucan, Reydick (2013). Thermal Studies of magnesium silicates from the Great Serpentinite Belt in New South Wales for CO2 sequestration by mineral carbonation in Australia PhD Thesis, , The University of Newcastle. Steel, Karen M. and Balucan, Redick D. (2013). Conversion of CO2 into mineral carbonates using a regenerable buffer to control solution pH. In: ICCS&T 2013: International Conference on Coal Science and Technology. Proceedings. 2013 ICCS&T: 14th International Conference on Coal Science and Technology, State College, PA, USA, (). 30 September-3 October, 2013. Balucan, R. D., Kennedy, E. M., Dlugogorski, B. Z. and Newcastle Innovation Limited (2012). Method of pre-treatment of lizardite. WO2012068638. Balucan, Reydick D., Kennedy, Eric M., Mackie, John F. and Dlugogorski, Bogdan Z. (2011). An optimized antigorite heat pre-treatment strategy for CO2 sequestration by mineral carbonation. In: Proceedings of 3rd International Conference for Accelerated Carbonation for Environmental and Materials Engineering. 3rd International Conference for Accelerated Carbonation for Environmental and Materials Engineering, Turku, Finland, (). 29 November - 1 December 2010. Ghoorah, Manisha, Balucan, Reydick D., Kennedy, Eric M. and Dlugogorski, Bogdan Z. (2011). Selection of acid for weak acid processing of Australian wollastonite for mineralisation of CO2. In: Proceedings of 3rd International Conference for Accelerated Carbonation for Environmental and Materials Engineering. 3rd International Conference for Accelerated Carbonation for Environmental and Materials Engineering, Turku, Finland, (). 29 November - 2 December 2010. Balucan, Reydick D. and Steel, Karen M. (2015). A regenerable chemical process for greenhouse gas control and metals recovery: Potential utilisation of Philippine nickel laterite and serpentinite resources. In: 30th Philippine Chemistry Congress, Davao City, Philippines, (). 15-17 April 2015. Steel, Karen M. and Balucan, Reydick D. (2015). Recent advances in the development of a new pH swing method based on a regenerable precipitant-solvent system for metals recovery and greenhouse gas control. In: 5th International Conference for Accelerated Carbonation for Environmental and Materials Engineering (ACEME15). 5th International Conference for Accelerated Carbonation for Environmental and Materials Engineering (ACEME15), New York, NY, United States, (21-27). 21-24 June 2015. Steel, Karen M and Balucan, Reydick D (2013). CO2 mineralisation using a regenerable buffer to control solution pH. In: 10th Australian Coal Science Conference, Brisbane, Australia, (). 18-19 November 2013. Steel, Karen, Alizadehhesari, Kimia, Fox, Kristiane and Balucan, Reydick (2013). Potential for CO2 sequestration as mineral carbonate within Ni laterite processing. In: Proceedings of ALTA 2013 Nickel-Cobalt-Copper Sessions. ALTA 2013: Nickel-Cobalt-Copper, Uranium-REE and Gold Conference & Exhibition, Perth, Australia, (424-431). 27-30 May 2013.